:: Forward to international events on December 18, 2011! :: Home ist where we want to live! For five years now, a process has been evolving. Women and men have decided to tell the world that they exist and that they are entitled to rights regardless of where they choose to live. "Nothing for us and without us" is the principle that has inspired the process through which migrants are retaking control over their destiny and regaining their voice that has too long been silenced by political authorities and experts. On the basis of the principles of freedom of movement between countries and the right to stay where one chooses to live, millions of migrants from the four corners of the world have decided to come together to shout to the global society: "Let us pass, let us circulate, let us live"(1). The World Charter of Migrants project was launched in Marseille in 2006 when 120 undocumented families mobilized to fight for their papers. It was one of the migrants, Crimo, who proposed the creation of a charter written by the migrants themselves based on their lives and their experiences. The first of its kind, the text was proposed at different international meetings and gathered support from a multitude of migrants who have since coordinated actions throughout their respective continents. These migrant leaders sought to put in place local assemblies that enabled a collective writing process based on discussions and exchanges between migrants. Various charter propositions emerged from the four continents and the international network produced a final synthesis of these texts. From September 2010 to January 2011, the final charter was disseminated throughout the local assemblies in order to relaunch a discussion at the global level. During this phase of discussions, changes, and amendments to the final text, migrants throughout the world began to adopt these principles. This contributed to a growing political and social dynamic. launched an action prior to the World Social Forum in Dakar. Gorée Island, a symbol of slavery and deportation, provided an apt location for migrants to propose a new era without barriers nor discrimination. The World Charter of Migrants is not just another declaration or a convention. It is an innovative document which seeks to allow all those individuals who witnessed a form of displacement, either against their will or through their own initiative, to create, through their life experiences, a Charter of principles that challenge the issue of fundamental rights - freedom of movement, to settle down freely, or to stay and live where they desire; the equality of rights in all realms of life between migrants and citizens of the immigration countries, as well as the right to exercise full citizenship based on residence and not nationality. The Charter does not seek simply to exist, it aims to launch a new battle, a global revolution for migration as a whole. This is why the movement endures despite the completion of the writing phase. Since February 2011, the local assemblies have engaged in a process of raising awareness about the Charter so that migrants can use it during their daily struggles for their rights and liberties. 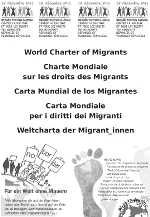 Nine months after drafting the Charter in Gorée, the World Charter of Migrants expanded and reorganized. An international promotion committee was created in May 2011 in order to facilitate the coordination between local initiatives and increase their visibility at the international level. In the future, depending on the needs of the local assemblies, the promotion committee can take on the role of launching international actions such as global signature campaigns or involvement of certain States via judicial or political advocacy activities. A website(2) was created in order to disseminate the Charter's text and all activities carried out by members of the network around the world. Activities take different forms according to the regional context (sensitization, advocacy, mobilization etc.) but all are based on one text, one vision and one common methodology: reaching the maximum number of migrants in order to support them within the framework of a global network and improve progress towards achieving their rights. In Belgium a meeting is planned for 19 November within the framework of the Festival des Libertés(3). Members of the network from different countries will present the principles of the Charter and the application of its methodology in the field. This gathering of members will also provide an opportunity to organize meetings with migrants in Brussels and Liège in order to inform them and discuss with different migrant communities present in Belgium. In addition, a global action is planned on 18 December 2011 in the context of World Migrants Day(4). This initiative was proposed by the Italian association Arci during the World Forum of Migrants in Quito in October 2010 and confirmed during the World Social Forum in Dakar in February 2011. Starting with the text of the World Charter of Migrants, different actions will be organized around the world which allow migrants to reclaim this day, which was created by the United Nations 11 years ago, with a new slogan: "for a day of global action against racism and for the rights, equality and dignity of migrants, refugees and displaced persons". This day will also provide an opportunity to present, in partnership with the organizations Utopia et Emmaüs, a passport cover for universal citizenship with text from the World Charter. Finally, we believe that the innovative process of the World Charter of Migrants lies in its very nature: without a hierarchy or a fixed structure, it necessitates the full engagement of migrants at the local level. Despite the difficulties that may arise, the inevitable success of this process lies in the fact that these migrants are the pioneers who are preparing today the new citizenship of tomorrow. 1 This text was inspired by a document written by Hicham Rachidi, member of the International Coordination Group of the WCM.